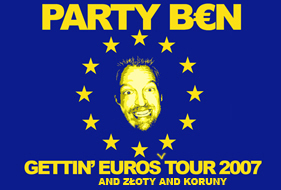 PARTY BEN'S EUROPEAN VACATION TOUR!!! Zut alors! / Wypas! / Scheibenkleister! / Haluzit! / Frickin' awesome! Settle down polyglots. Yes, the rumors are true, I'm heading to Europe for a while to take advantage of the favorable exchange rate. Coming up in November and December, I'll be DJing for the first time in Poland, Germany, Belgium and possibly the Czech Republic, and returning (triumphantly? confusedly?) to France. It's all a bit seat-of the-pants, so to speak, so a couple gigs are still up in the air, but I've been waiting for like two weeks to put up this silly graphic, for Kaczyńskis' sake. I'll be kicking off the tour in Poland on Nov. 16 and 17 in Krakow and Warsaw with El Barto & Liam B (with more dates probably to come), then heading over to the Czech Republic and Germany (where things are still a bit hazy). After that I meet up with DJ Zebra for a night in Liege, Belgium on Nov. 23, then I'm heading back to Germany for a still-in-the-planning-stages Bootie Munich on Nov. 24. After that I hook up with the Zebramix tour featuring the aforementioned Zebz along with rock-'n'-roller DJ Moule for four exciting dates across France. That's about three weeks of bouncing around Europe, and I'm going to attempt to do this out of one little carry-on bag, with room for like two shirts, so if you notice a kind of rancid stench in the Bordeaux area in late November, that might not be the pot au feu. For all the info, dates, and locations (plus even some links to buy advance tickets!) head over to the events page, and keep checking back for updates. Of course any of you who are actually in Europe, it would be great to say hi, so come on by. Or if you know any good (cheap!) restaurants in the area, drop a line.